Sometimes it feels like there's almost no unique names amongst my Facebook friends. Whenever I use the search function and start typing someones name at least two friends' names pop up. However, I only have one friend called Åsa and one friend called Conrad. So it got me wondering how many of my friends names are unique? So I pulled down the names of all my 500+ friends and counted them. The results were suprising! That means that 56% of my friends' names are unique! Much more than I expected. I should add, the bulk of my friends are primarily from two countries: USA and Sweden. From all over the world too but these are the most common. However, because of this I have some friends who have the locale's spelling. I.e. "Michael" in USA versus "Mikael" in Sweden. 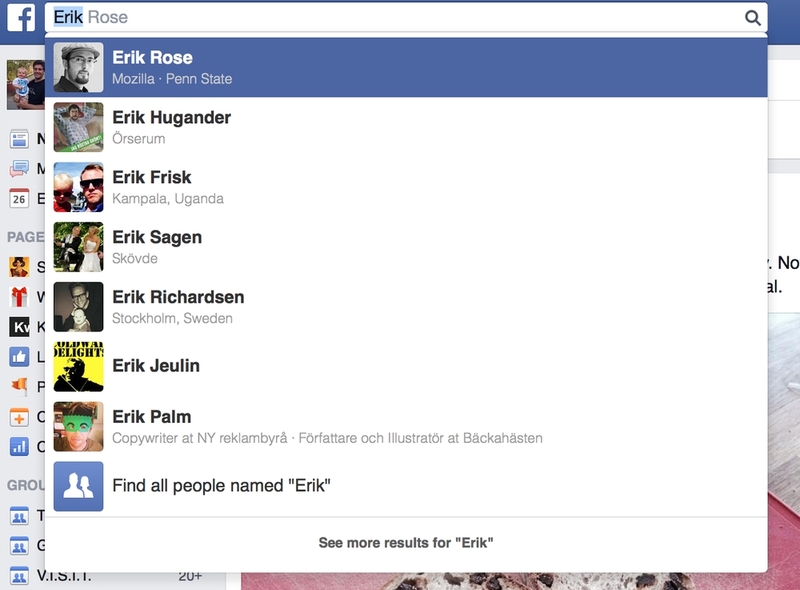 So, if I manually go through the list and look at some names and come up with some aliases so that Eric and Erik counts as the same name, I get a lot less uniqueness. The list I made is available here and it's very much a quick judgement call based on a rough idea of the "stemming" of these names. And the number of people with unique names goes down to 50.1%. Still more than half.